Dockless Bike-Share Launched in Denver Three Weeks Ago. How’s It Going? A pilot program launched by the University of Denver last month may signal a new era for bike-share in Denver. The university is testing out a dockless bike-share service that could scale up citywide if successful. The one-year trial, which has the blessing of Denver Public Works, is a partnership between DU and Ofo, a Chinese start-up that operates dockless bike-share in Aurora and in cities around the world. 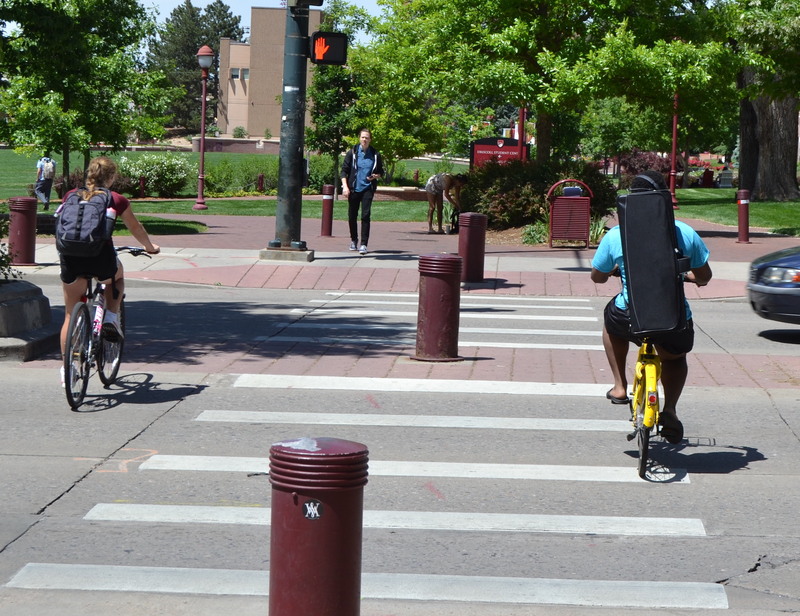 Only people with a DU email address can register, but they can ride and park the bikes on city streets well beyond the campus boundaries. B-Cycle vacated the area in 2016, and the pilot gives students, faculty, and other employees a bike-share option again. The pilot launched on May 7 with 200 bikes, and about 3,000 registered users have signed up, according to Chad King, director of sustainability for DU. “There’s been a great buzz about it and a ton of use, especially during the free period as we were trying to get it going.” King said. How much is “a ton”? According to Ofo, people have taken 30,000 trips since May 7, or more than six trips per bike each day. That’s an impressive number, but it’s impossible to verify. Ofo has given out immensely inflated ridership data before. Based on his anecdotal observation, King said, “that’s probably accurate.” I spent some time at DU on Thursday and the Ofo bikes did seem to get a lot of use — six people picked up and dropped off bikes at the student union in a five-minute span. One condition of a larger public arrangement with Ofo should be transparency about trip data. Motivate, the company that operates Citi Bike in New York and several other large station-based bike-share systems, publishes scrolls of data about ridership and the condition of its fleet. Trip data comes from a public, real-time feed maintenance issues to incident reports. Here in Denver, Ofo is in negotiations about data transparency. 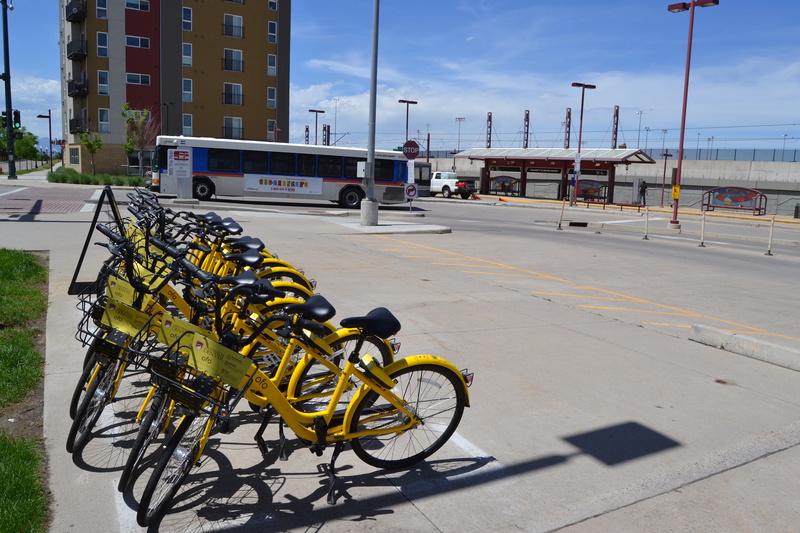 “We’re still working with DU and the city around what trip data, exactly, will be public versus not,” said Patrick Quintana, Ofo’s general manager for the Rocky Mountains. Ofo will submit its first monthly report next week. Are the bikes cluttering sidewalks? DU student Troy Andrews, 19, said he’s been using Ofo as “easy transportation between classes.” He’d like to see the bikes maintained better, he said, but thinks the pilot should become permanent. “I like it because it’s very convenient in terms of being able to pick up a bike, go from one side of the campus to the other in six minutes because these bikes are available,” he said. Bike-share is useful when the fleet is large and people don’t have to go very far to pick up a bike. For dockless bike-share, large fleets also pose a challenge because some bikes tend to get placed where they block sidewalks and curb ramps. 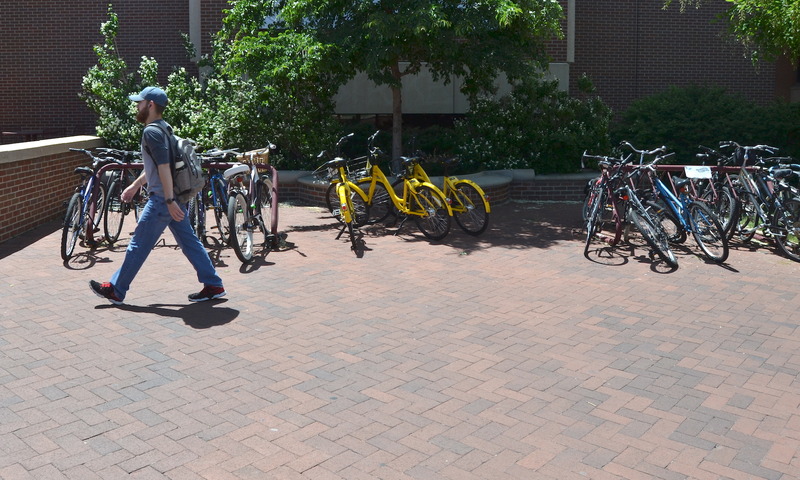 DU is addressing the issue by setting aside designated bike-share parking zones. On campus, students were mainly using these areas and keeping the bikes out of the way of foot traffic. On city-owned sidewalks, meanwhile, riders are supposed to park bikes at bike racks and on tree lawns. “We have received a modest number of complaints directly and DU is reporting positive anecdotal feedback from users,” Cindy Patton, DPW parking and mobility manager, said in an email. The complaints “have been few,” she said, and have centered not on parking problems, but on people riding on the sidewalk — a problem of few dedicated bikeways, not bike-share itself. What sort of trips are people making with dockless bike-share? It’s too early to tell how many bike-share trips are replacing car trips or helping people link up with transit. DU has a survey that will help answer those questions. Ofo has to survey riders once as part of its contract, and Quinatana called reducing car trips “a relevant data point” to include. King shared a story about yellow Ofo bikes replacing a queue of Ubers outside student housing in the evenings, and a photo of 15 Ofo bikes outside a bar. You’ll see a group of frat brothers in suits heading to an event on the bikes, whereas before they may have piled into cars, King said. Then there’s the groups of riders heading to Wash Park — a long walk from campus but a very bikeable trip that’s tempting to drive. Andrews said he replaced his 20-minute walk with a quick bike ride. After three weeks, King said one thing is clear, above all else: There was latent demand for bike-share. bike-share program in the world outside of China, reports that well over half its bikes are stolen or vandalized each year. In short, bike sharing seems to be mainly a political ploy to make elected officials look hip and build up support from the few people and companies that truly benefit from the programs. Cities that are truly interested in cycling should do things like maintain the streets (cyclists find rough pavement far more annoying than auto users), make traffic signals responsive to cyclists, and provide safe bicycle boulevards parallel to major arterials.